After a tumultuous beginning to their relationship, Arie Luyendyk Jr. and Lauren Burnham are ready to start their lives together, and as quickly as possible. In an interview with People magazine, the couple revealed they want to get married right away—like sometime this year—even though Arie just proposed on Tuesday night's live After the Final Rose special with a 3.5-carat Neil Lane ring. "We’ve already been planning it, even before the engagement," Luyendyk Jr. revealed. "We want to do it quickly!" Plus, the couple is actually considering a televised wedding. Which is surprising to hear, after all the hate they received on social media after Arie's change of heart and dramatic breakup with Becca Kufrin. But Lauren's not bothered by the naysayers. "We don’t really care what anyone else has to say about it," she said. Obviously, the couple is in a much better place. The racecar driver even posted a heartfelt picture on social media—his first Bachelor-related post since February. "Everyone finds each other in a different way. It’s not always a fairy tale, but as long as Lauren and I have each other, we’re happy," he told People. And someone else who's ready to find her fairy-tale love story? Arie's ex-fiancee Becca, who has been named the next Bachelorette. Her season premieres in May, but Arie's now claiming he's the one who solidified her position. This 3-hour event left audiences disappointed and sad. 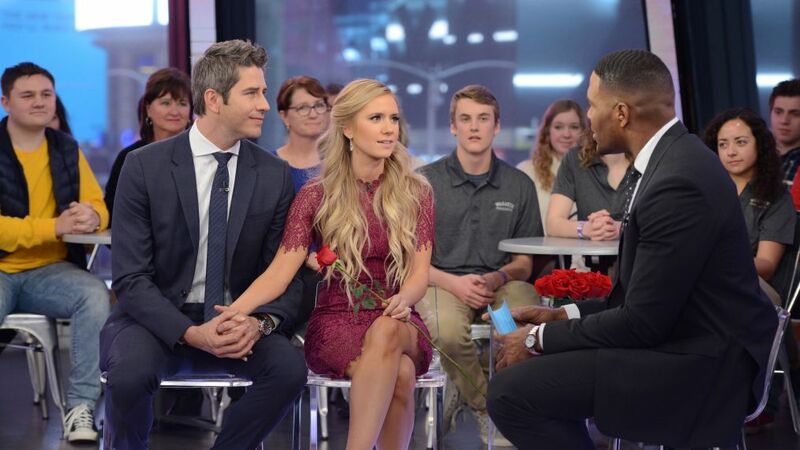 The 36-year-old told Michael Strahan on Good Morning America that he not only filmed the breakup to show America their broken relationship was all his doing, he did it so Becca would be cast as the next reality star. "I wanted her that opportunity, honestly. I wanted her that opportunity to be the potential Bachelorette," he said. Maybe that wasn't the best claim to make, Arie. As the potentially most hated Bachelor in America continues on his press tour, try to avoid highways, because fans are coming for him via billboards. They're sprouting up in Los Angeles and in Becca's hometown in Minnesota, and now there are a total of 17 across the nation. The shame tour is very real.